This new 10,000 sf building now is being constructed on private property west of the Surbeck Center. 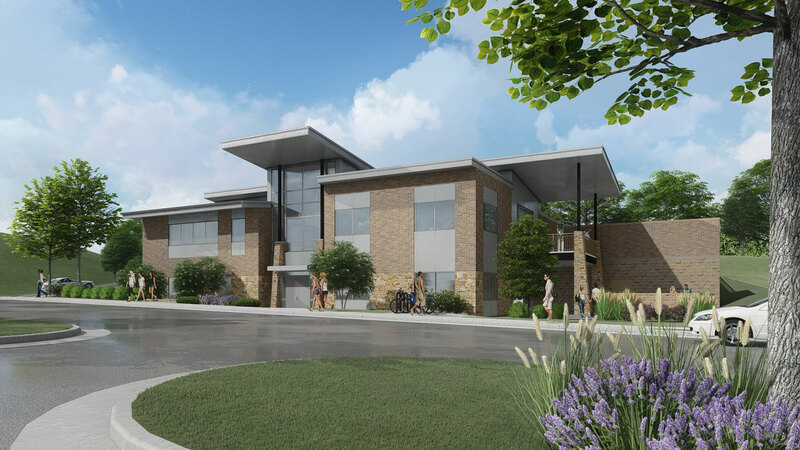 It will house SD Mines Foundation offices on the second level, with Alumni Association offices on the first level. The center will include meeting and conference rooms and a large event area for SD Mines needs. TSP designed the two-story building to fit the sloping site. Visitors will find easy access from the street-side entry on the first level as well as the parking-lot entry on the second level. The lot will include 14 spaces and be bordered on one end by a 12-foot-high retaining wall. TSP’s civil engineering team provided water, sewer, and storm sewer services. Their design also expanded the existing stormwater quality/detention pond to accommodate the increased amount of impervious surfaces on the site. Completion is anticipated in April 2019.